WHEN AN URBAN LANDSCAPE changes it seems everyone has an opinion about it but when the accompanying soundscape changes very few seem to notice. In a city like Paris where the soundscape is dominated by a blanket of noise pollution caused by incessant traffic one might assume that a change to the landscape, unless it involves a major re-routing of traffic, is unlikely to make much difference to the soundscape. But to the attentive listener there are examples where a change to the soundscape can change the character of a place just as much as a change to its landscape. A development in rue Dénoyez in the east of Paris is one such example. Once a very run down part of the commune of Belleville in the east of Paris, Rue Dénoyez was revived in the second half of the twentieth century with the arrival of artists who saw the decaying walls and empty shop fronts as a huge canvas upon which to display their talents turning the street into a constantly changing plein-air art gallery. The commune of Belleville is particularly sound rich and so I go there frequently to capture different aspects of the multi-cultural soundscape and each time I go I call into rue Dénoyez to watch and listen to the artists at work. 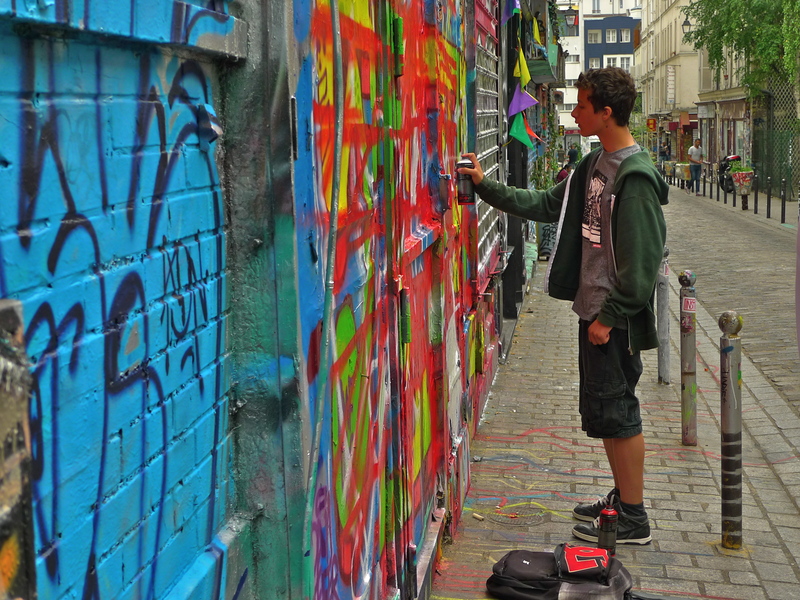 When I went there two years ago, in November 2014, I discovered that under the banner ‘Sauvons la rue Dénoyez’ – ‘Save rue Dénoyez’, a petition had been drawn up to challenge a plan by the local authority to demolish part of rue Dénoyez and replace the artists’ workshops and galleries with subsidised housing and a community centre. The development proposal called for the buildings between N°18 bis and N° 22 bis to be demolished and replaced with 18 subsidised housing units and a crèche as well as the redevelopment of N° 24 and N° 26 rue Dénoyez and N°10 Rue de Belleville into 29 subsidised housing units and a community centre. Despite the petition opposing the development receiving 10,000 signatures in six months, the work was slated to begin in the summer of 2015. Any project mired in French bureaucracy is likely to remain there for a very long time, but when I called into rue Dénoyez in July this year I found that, although the work hadn’t yet begun, the artists’ studios and galleries were empty and shuttered and the emergence of ominous looking green barriers seemed a portent of imminent construction, or more appropriately, destruction. Fast forward to November this year, last week in fact: now the wrecking ball has done its work and the artists’ studios and galleries have disappeared to be replaced by a slash in the landscape. Knowing rue Dénoyez as well as I do, I must admit that seeing this new landscape for the first time came as a shock – more of a shock than I’d expected actually – and it took a while for me to absorb the dramatic change of scene. Of course, this slash in the landscape is only temporary – the gap will be filled by the new housing project, but for me as an archivist of the contemporary soundscapes of Paris the transience of this gap is important because not only does it change the soundscape of the street but it also gives us a hint of what the future soundscape of rue Dénoyez may be. I decided to capture the soundscape of rue Dénoyez complete with its new, temporary, gap. I began my soundwalk at the south-east end of rue Dénoyez, the opposite end from the demolition site. The sounds of dry autumn leaves scudding along the road, a young man firing up his motorcycle, footsteps passing, doors opening and closing, children making for the local piscine and neighbours gossiping filled the air in this part of the street much as they had before. But as I approached the north-western end of the street and the slash in the landscape (8’ 51” into my soundwalk), the soundscape in rue Dénoyez changed noticeably from what it had been two years ago. Instead of the sound of artists at work shaking their aerosol cans filled with paint and spectators watching and commentating with their cameras clicking, now there was now an eerie quiet broken only by the distant sound of a crow and the rather melancholy sound of a dilapidated washing machine being hauled over the pavé. And the change to the landscape is not yet finished. The building below, until recently a bistro, on the corner of rue Dénoyez and Rue de Belleville is to be redeveloped into 29 subsidised housing units and a community centre thus changing both the landscape and the soundscape even further. I began by saying that when an urban landscape changes it seems everyone has an opinion about it but when the accompanying soundscape changes very few seem to notice, and this is certainly true of the development in rue Dénoyez. The demolition work in the street is impossible to miss and no doubt everyone has an opinion about it but the change to the accompanying soundscape is subtle and requires both attentive listening and a knowledge of the street as it once was to recognise that there has been a change. My sonic exploration of places in Paris usually consists of hunting out two types of sounds: the ‘characteristic’ sounds, the everyday sounds that exist in a place but are not necessarily unique to it, and then the ‘unique’ sounds, the sounds that actually define or help to define a place. 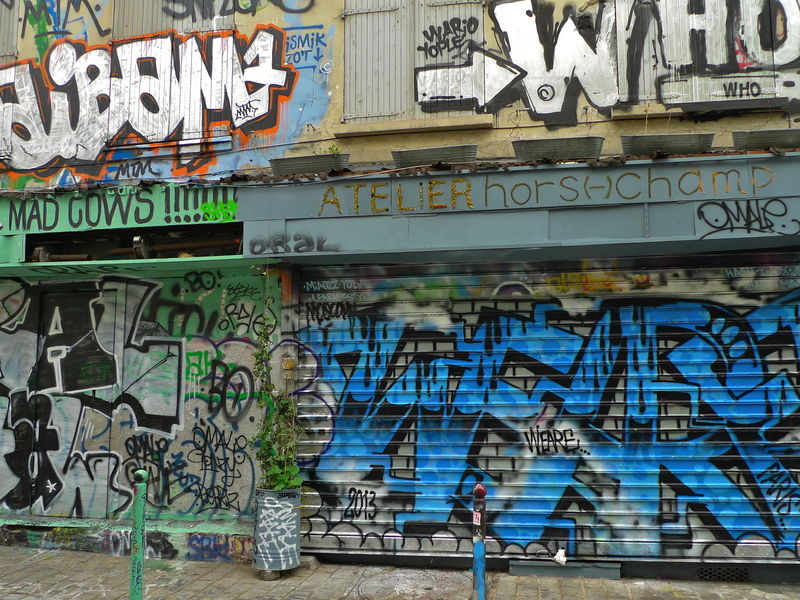 In its prime, rue Dénoyez had its ‘characteristic’ everyday sounds but more importantly it had ‘unique’ sounds – the sounds of artists at work shaking their aerosol cans filled with paint, which occasionally exploded, and the sounds of spectators watching, commentating and clicking their cameras. These were the sounds that defined the street. Once the housing development is completed perhaps the everyday sounds of the street will not change all that much – dry autumn leaves will still scud along the road, footsteps will still pass, doors will still open and close, children will still make for the local piscine and neighbours will still gossip in the street, but what about the ‘unique’ sounds, the sounds that once defined this street? The local authority say they will leave some space for plein-air art in the street but with the artists’ studios and galleries now demolished it seems the artistic soul of the street together with its once unique soundscape have been lost. But at least I have the sounds of rue Dénoyez in its heyday safely in my archive – although now in the ‘Vanishing Sounds’ section. 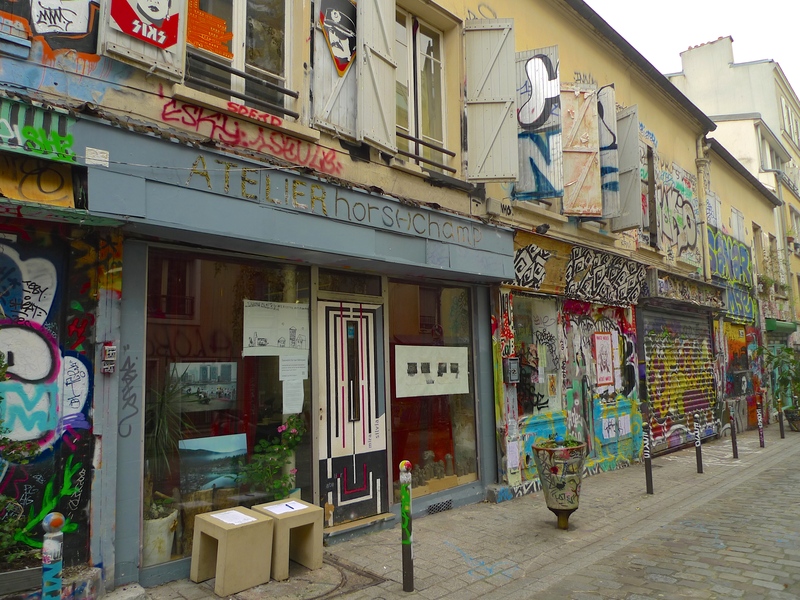 I LAST FEATURED rue Dénoyez, the plein air art gallery in the 20th arrondissement, in this blog in November 2014. 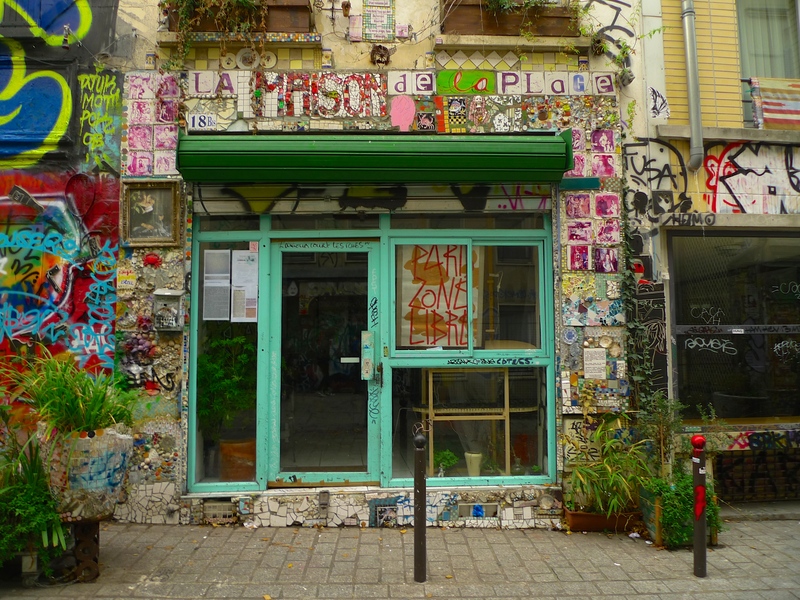 At that time, under the banner ‘Sauvons la rue Dénoyez’ – Save rue Dénoyez, a petition had been drawn up to challenge a plan by the local authority to demolish part of rue Dénoyez and replace the artists’ workshops and galleries with subsidised housing and a community centre. 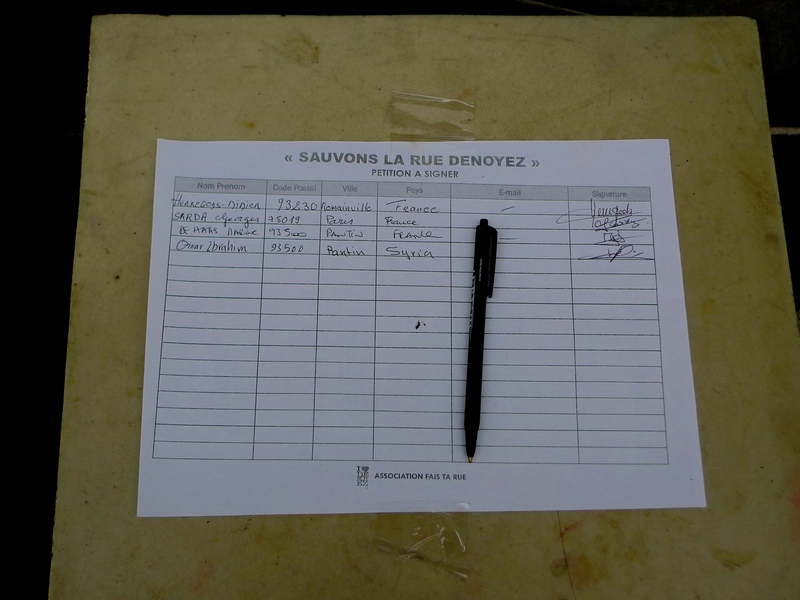 The other day, I went back to rue Dénoyez to see what has happened since I was last there. The development proposal calls for the buildings between N°18 bis and N° 22 bis to be demolished and replaced with 18 subsidised housing units and a crèche as well as the redevelopment of N° 24 and N° 26 rue Dénoyez and N°10 Rue de Belleville into 29 subsidised housing units and a community centre. Despite the petition opposing the development receiving 10,000 signatures in six months it seems the project is still going ahead. Although the demolition work was due to have been completed by April this year I found that little seems to have happened so far except that the occupants have left and the buildings stand hauntingly empty. Undaunted though, I found one street artist still leaving his mark. At the end of my soundwalk I came upon a man who had lived in rue Dénoyez in the early 1970s and he reflected upon life here in those days. If all goes to plan, work on the new development will be completed in the spring of 2018. While new social housing is to be welcomed one can’t help feeling that some of the character of this unique street will be lost in the process. As the man who spoke to me said, “il faut que ça change”. You can see the presentation prepared by the local authority about the new development here. 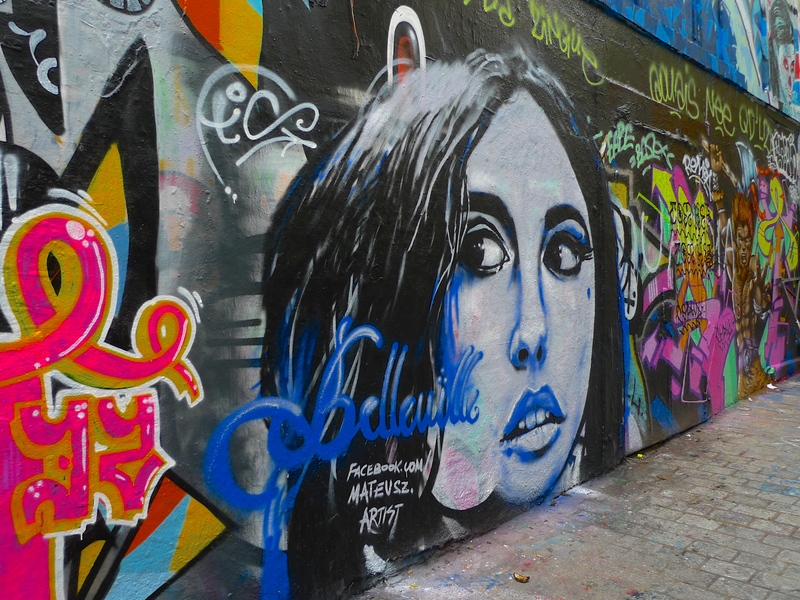 TWICE IN THE LAST few weeks I’ve found myself in rue Dénoyez, the fascinating plein air art gallery in the 20th arrondissement where the walls are covered with a kaleidoscope of constantly changing street art. On the first of my two recent visits to this street I was being interviewed for a prospective radio piece and on the second, I was recording a conversation with my good friend, Heather Munro, who was taking a short break from the dramatic sub-zero temperatures in Minnesota, USA. 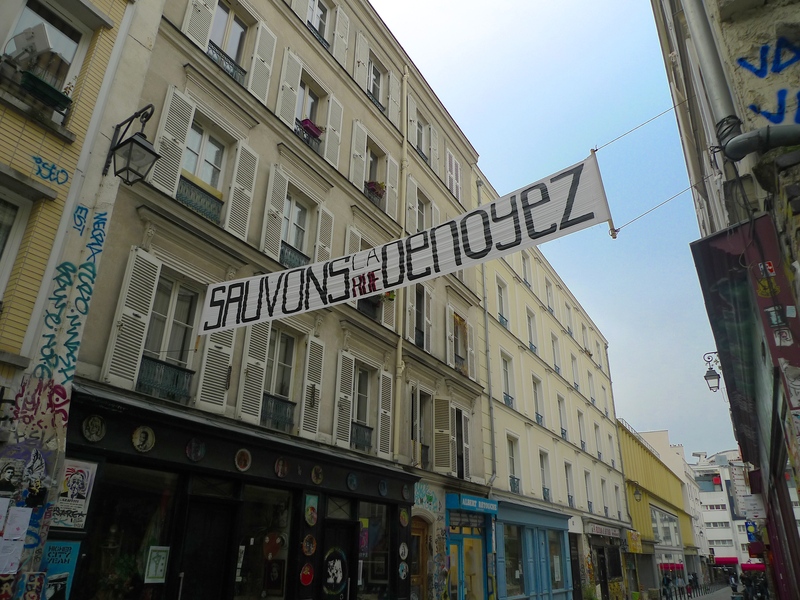 On both occasions I was asked about the banner that has appeared across rue Dénoyez, ‘Sauvons la rue Dénoyez’ – Save rue Dénoyez – and I had to admit that I didn’t know anything about it. I had no idea why it was there. But I can now put that right! 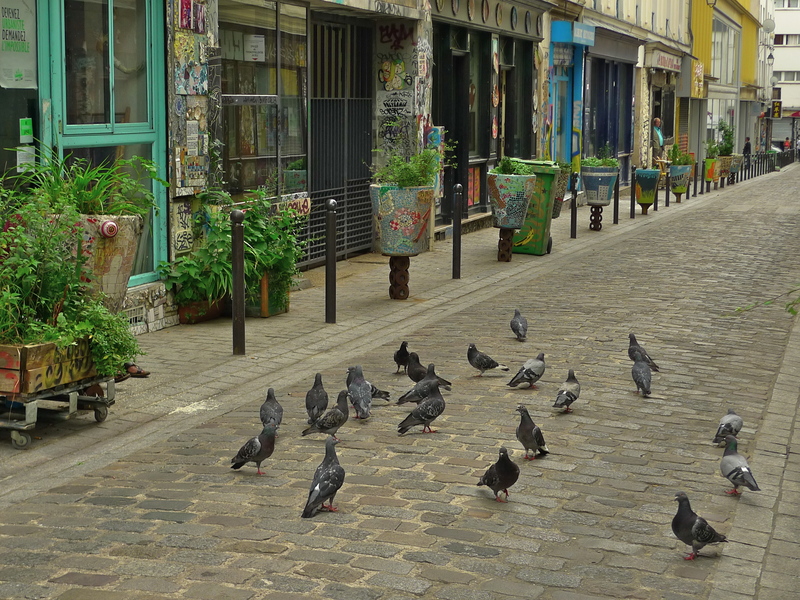 Rue Dénoyez is in Belleville in the east of Paris and before 1860 Belleville was a very lively place. Then, it was outside le mur des Fermiers généraux, the tax wall that surrounded Paris, which meant that alcohol was tax-free and therefore much cheaper than within the then Paris City limits. Consequently people from Paris would come to the cafés, bars and cabarets in Belleville in great numbers to drink and dance and have a good time. After 1860, all that changed. Belleville was absorbed into the City of Paris and with the advantage of tax-free alcohol now gone Belleville began a long and steady decline. And rue Dénoyez suffered from that decline. In the 20th century immigrants began to arrive in Belleville with Jews fleeing from Germany coming in the early 1930s and Spaniards in 1939. Many Algerians and Tunisian Jews arrived in the early 1960s and then came an influx from the Maghreb. In the 1980s it was the Chinese and more recently, sub-Saharan Africans. All this has contrived to make Belleville the colourful melting pot of different nationalities that it is today. 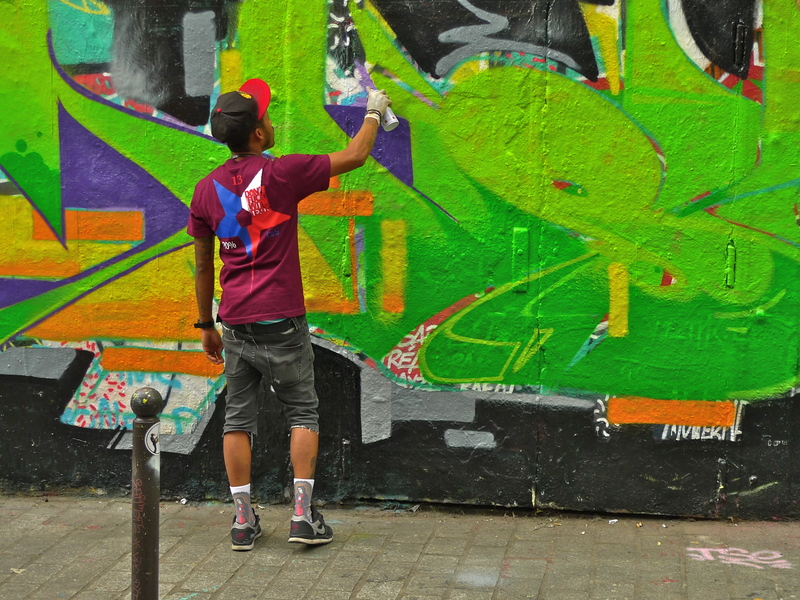 Revival for rue Dénoyez began with the arrival of the artists who saw the decaying walls and empty shop fronts as a huge canvas upon which to display their talents. 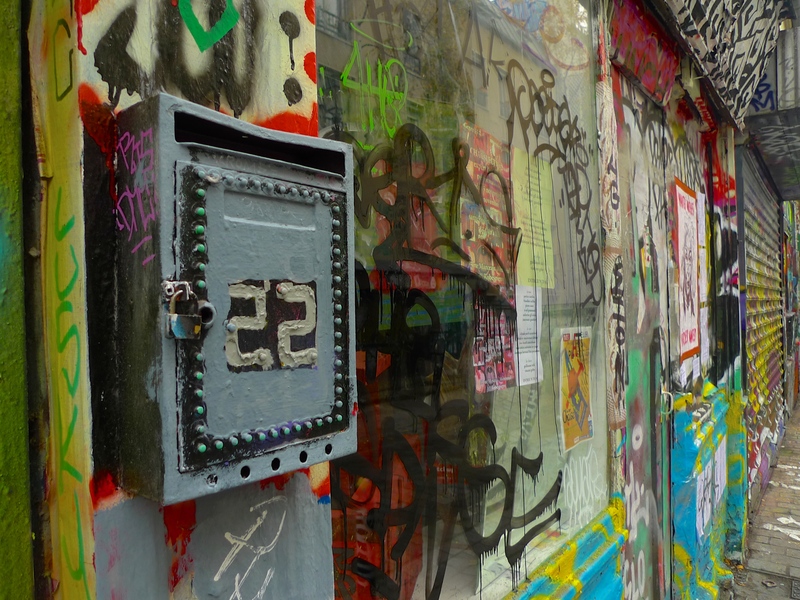 Today, rue Dénoyez is home to several art galleries like Frichez-Nous la Paix at N° 22 bis and La Maison de la Plage at N°18 bis for example, which provide a space for artists to work and exhibit their work. 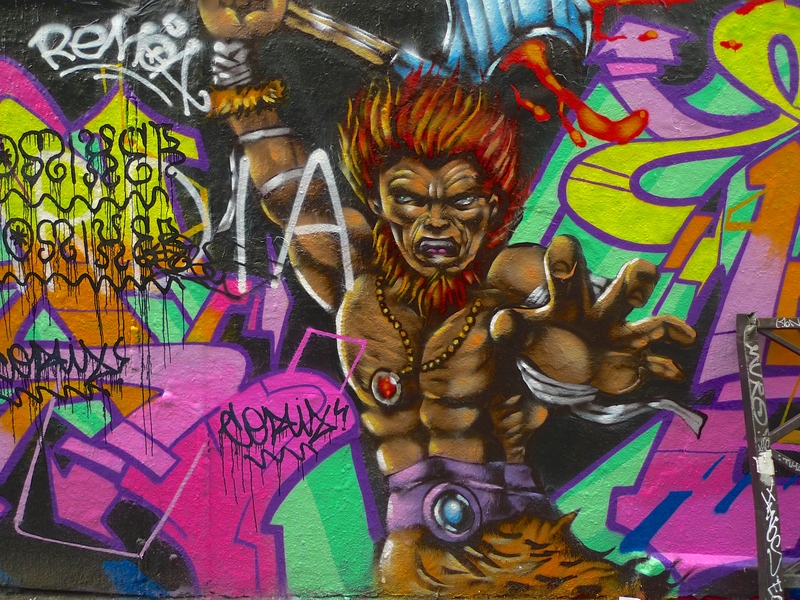 And the work of these artists also spills over to the walls and surrounding buildings along the street. 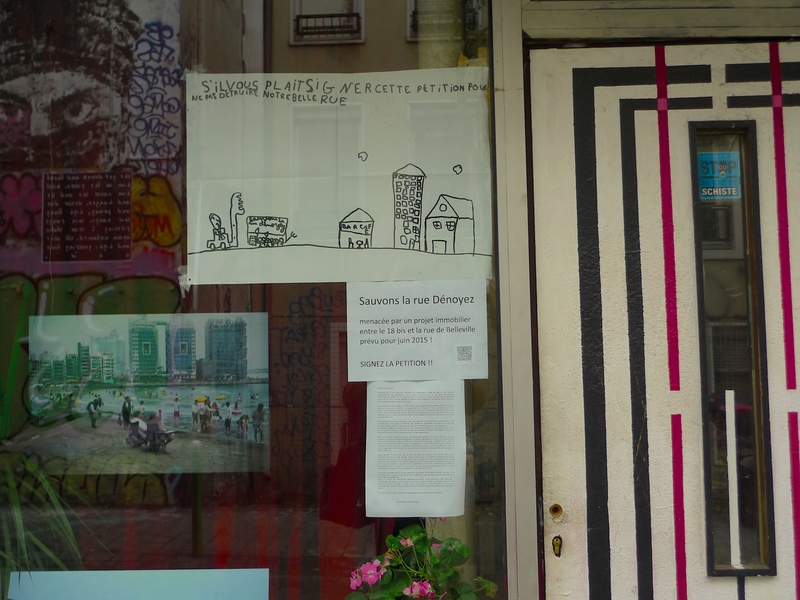 So what’s the story behind the banner across the street, ‘Sauvons la rue Dénoyez’? 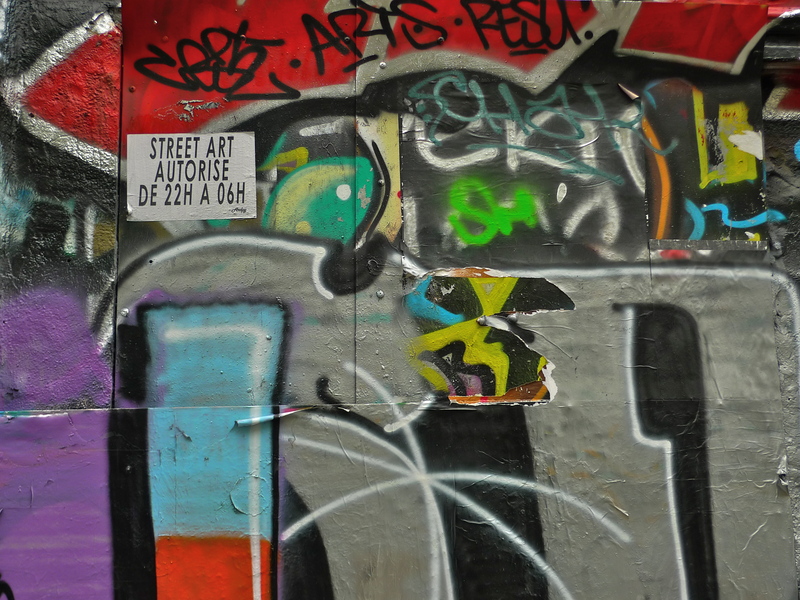 The banner was erected in early October in response to a proposal to build two subsidised housing projects in the street that could see the end of rue Dénoyez as a plein air street art gallery. The proposal calls for the buildings between N°18 bis and N° 22 bis to be demolished and replaced with 18 subsidised housing units and a crèche as well as the redevelopment of N° 24 and N° 26 rue Dénoyez and N°10 Rue de Belleville into 29 subsidised housing units and a community centre. In a city as unaffordable as Paris it’s hard to argue against more subsidised housing but one might ask, as the residents of rue Dénoyez are, why choose this particular street? The local council claim that there is no alternative, this is the only space available they say. 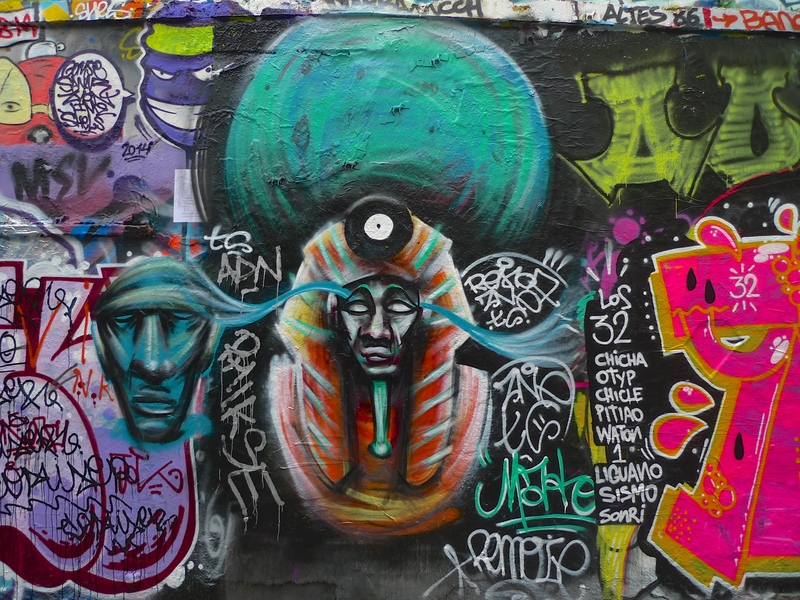 Paradoxically, the Mayor of Paris, Anne Hidalgo, has expressed her determination to further develop urban art in the city. Outside the Atelier Hors-Champ I spoke to a man who was about to sign the petition that has been set up. He told me that he thought the development was bound to go ahead and probably the best they could hope for was to delay it. The work is due to start in July 2015. On the first of my recent visits to rue Dénoyez I recorded a soundwalk along the street, although I didn’t realise at the time that this, along with my other recordings of this street, will become historically significant if and when the development of the street begins and its character inevitably changes. Fairly soon these recordings could become more sounds to add to my list of the ‘vanishing sounds’ of Paris. These sounds though are interesting for another reason, a rather amusing and slightly bizarre reason. Walking along the street I recorded the sounds around me including the sound of the artists shaking their aerosol cans of paint as they went about their work. These sounds were to take a bizarre twist as I came towards the end of my walk. A middle-aged man, obviously in the midst of a mid-life crisis, had been watching an artist at work. When the artist finished and moved off, the man picked up a discarded paint can and for some inexplicable reason decided to bang it against the wall. You can listen to what happened next 6 minutes into my recording. 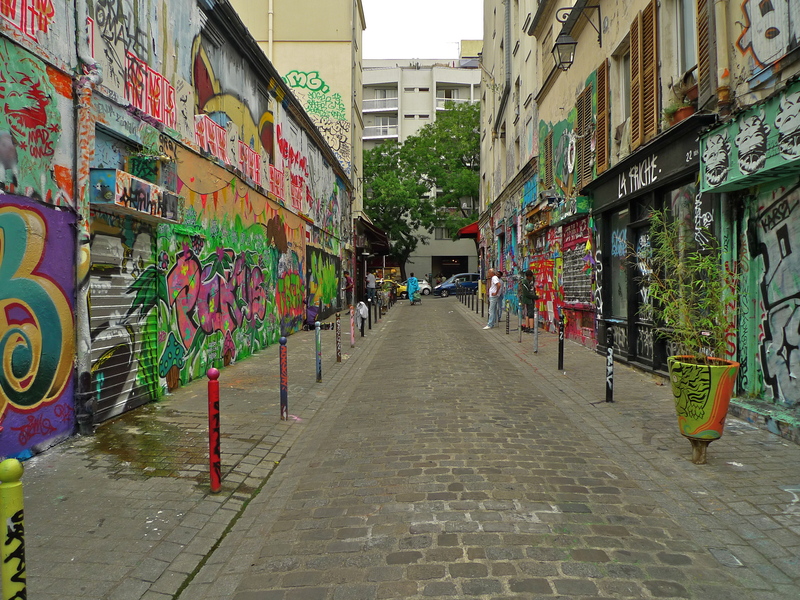 If the proposed development does go ahead the character of rue Dénoyez will undoubtedly change, but my abiding memory of the street will always be the sound of that exploding aerosol can. Somehow, it seems to portend the arrival of the wrecking ball. 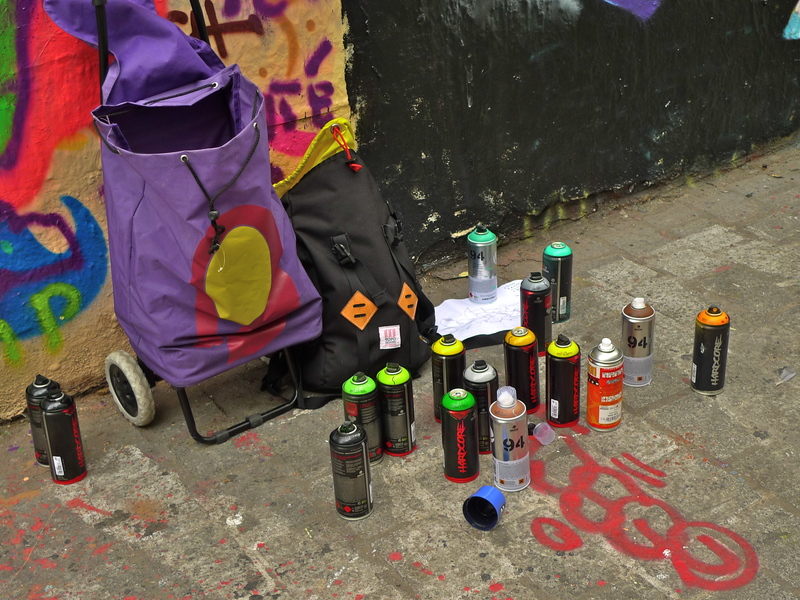 So, as my tribute to rue Dénoyez and its artists it seemed fitting to use the sounds of the exploding can and turn them into my own small piece of street art – my contribution to the legacy of this colourful street. 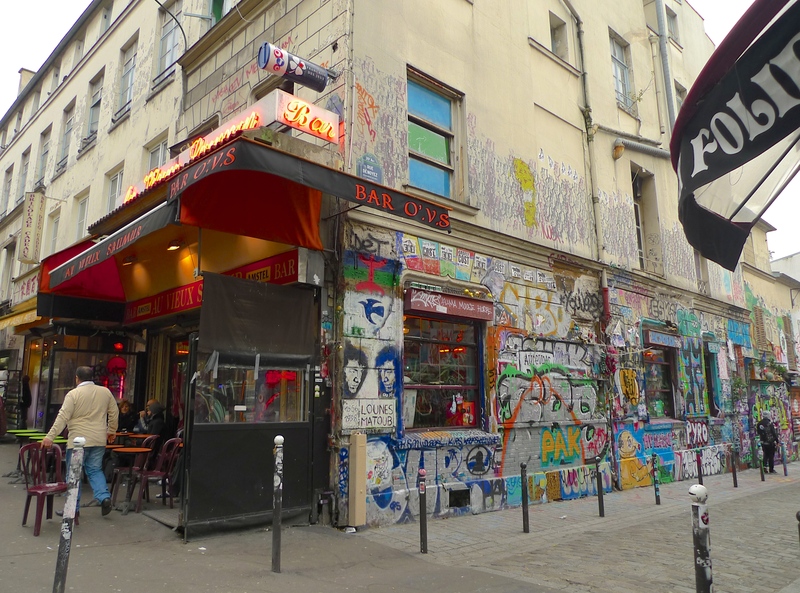 THE RUE DÉNOYEZ in the east of Paris is about as far removed from the tourist guide, Haussmannian, picture postcard Paris as it’s possible to get. The Rue Dénoyez is a narrow cobbled street near the bottom of the rue de Belleville. It takes its name from the tavern Dénoyez, a mecca of entertainment in the 1830’s. At the head of rue Dénoyez, where it joins the rue de Bellville, still stands the famous café, Aux Folies, named after an 18th century watering hole in the then rural quarter of Courtille, famous for the annual debauches of the city carnival known as the descent de la Courtille. 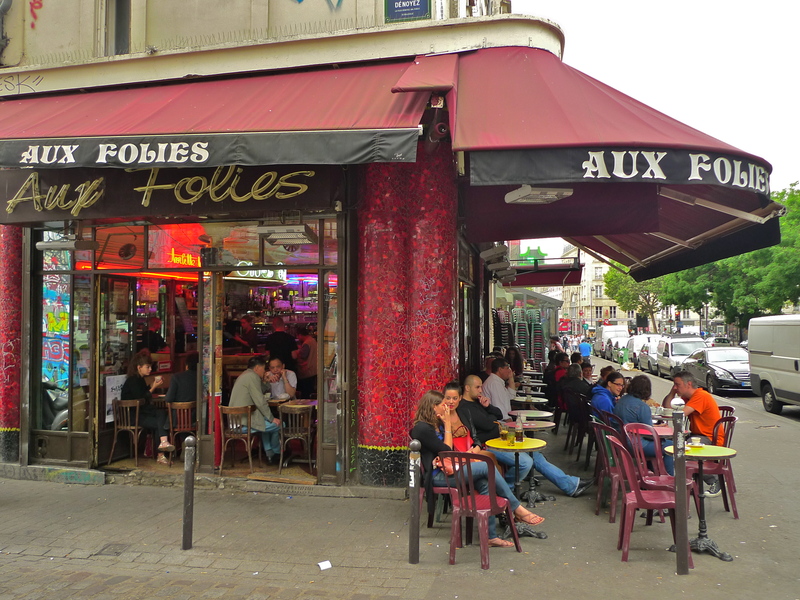 In the 20th century, Aux Folies was a favourite haunt of both Edith Piaf and Maurice Chevalier. 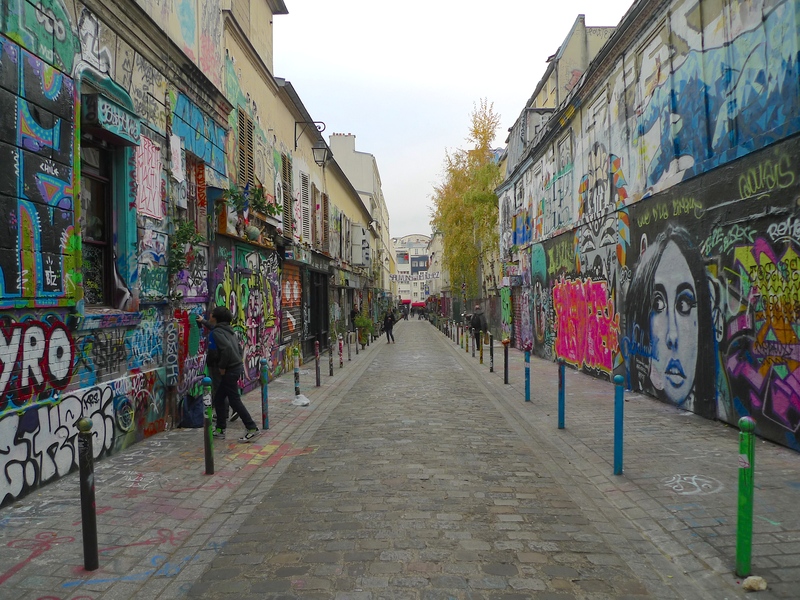 Until fairly recently the rue Dénoyez was in a sad state of decline but today it’s been revitalised. 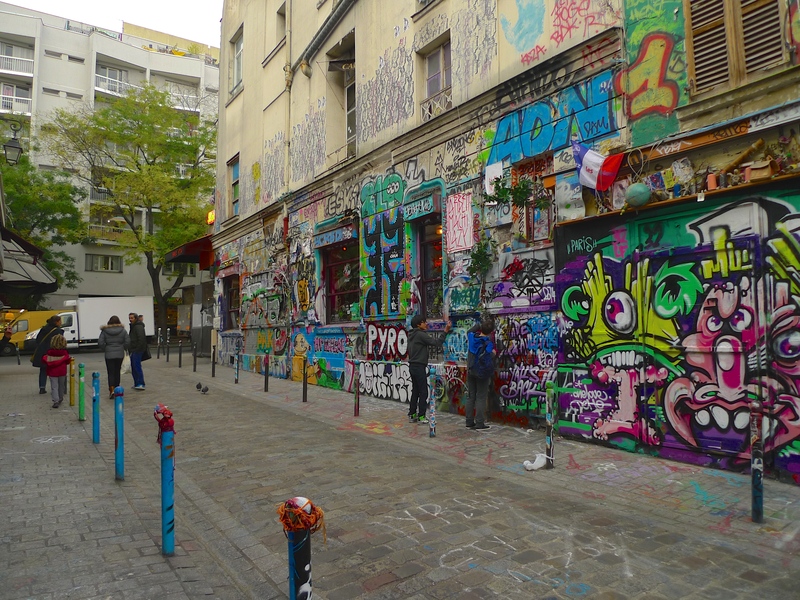 Now it’s home to vivacious street art where spraying graffiti onto the walls is not a crime – it’s actually encouraged, turning the rue Dénoyez into one of the most colourful streets in Paris. 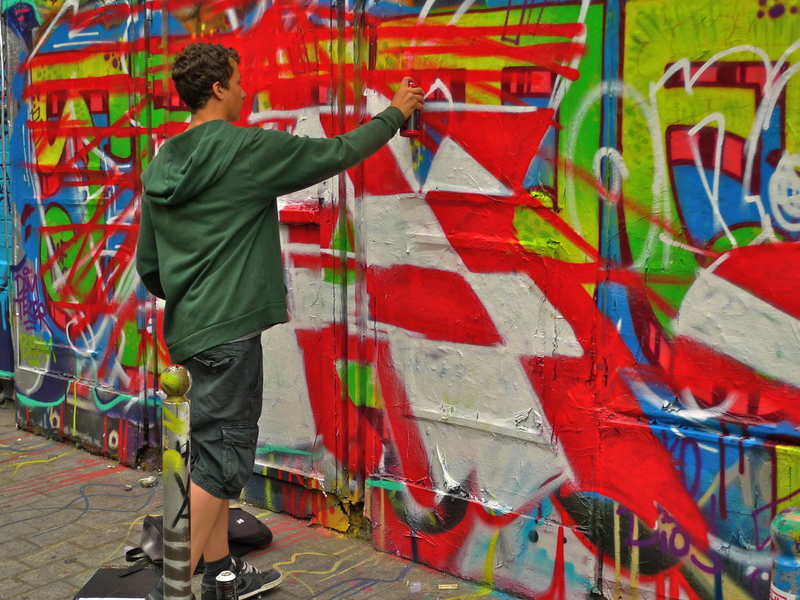 And the street artists go about their work with enthusiasm. I like Belleville. I find the multi-cultural atmosphere exciting, stimulating and fascinating. 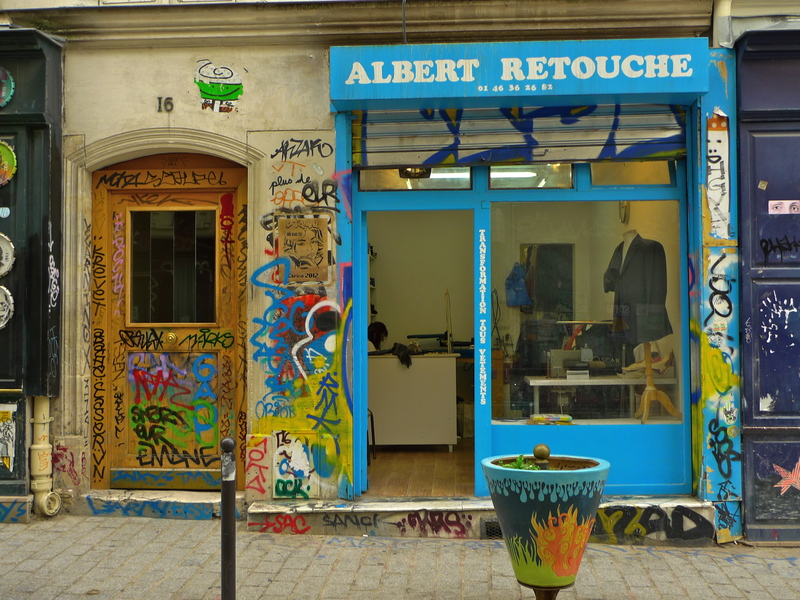 And every time I go, I visit rue Dénoyez – and every time it’s completely different. The street art on the walls seems to change by the day. New artists appear expressing their own talents and creating their own art. Walking along the rue Dénoyez it’s hard not to be seduced by the visual impact – the shapes, the colours and the artists at work. But for someone wired up like me, there is a listening experience to be had in this street too. 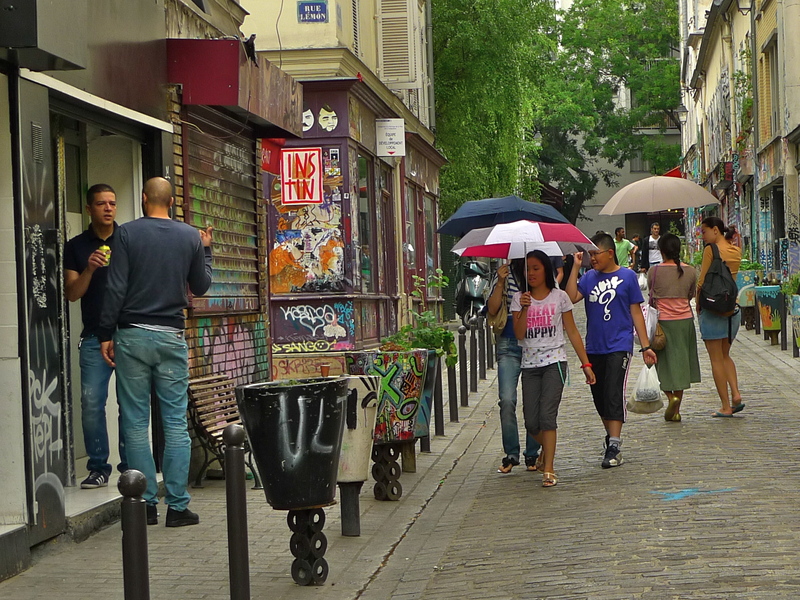 My soundwalk in the rue Dénoyez reveals the sounds of the street artists shaking their aerosol cans. The sounds of pigeons taking flight in the blink of an eye. And even the sound of a sewing machine in this tailor’s shop. All these sounds, and more, are contained in my soundwalk along the rue Dénoyez and, for me at least, they provided a counterpoint to the visual assault on my senses as I walked along the street. It did occur to me though that a series of loudspeakers along the street would provide a wonderful opportunity to add ‘sonic graffiti’ to complement the ever-changing visual street art. That sounds like a plan that I shall have to investigate.